The Fall 2015 season is just about wrapped up! It’s time to look back at the Crunchyroll series I said I’d follow and see if the series I picked to watch were enjoyable! Julis, as royalty, knows how to work a crowd. Capture from the Crunchyroll stream. Quick Summary: Amagiri Ayato transfers to Seidoukan Academy, where he meets and befriends Julis-Alexia van Riessfeld. They are both Genestella, which means they are very powerful in terms of combat capabilities. Schools like theirs exist to refine Genestella warriors. Ayato and Julis have their own goals, and when they’re not making friends like Sasamiya Saya or Toudou Kirin, they’re fighting in tournaments or helping the academy’s elite like Claudia Enfield. 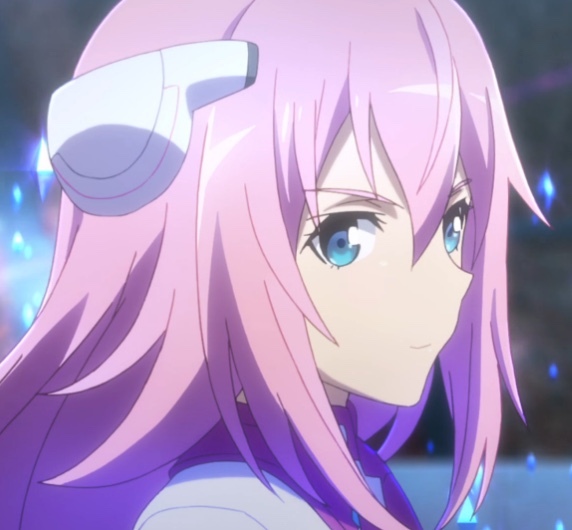 I reviewed The Asterisk War’s episodes in this blog. How’d It Do? I liked it! In some ways, it was a typical high-school/super powered/fighting/harem show. What distinguished it, though, was that The Asterisk War gave us more complex, interesting, and likable characters. I felt sympathetic towards Julis and I really wanted to see her succeed. I cheered for Kirin when she broke free of her idiot uncle. I even felt sorry for Claudia despite everything she has going for her because she’s hemmed in and only partially able to determine the course of her life. The show also showed more heart than I expected. So overall, I recommend The Asterisk War! I’m glad it’s going to get a second season in April 2016. Kujō wasn’t always in touch with her feelings, but she learned to let her partner help. Capture from the Crunchyroll stream. 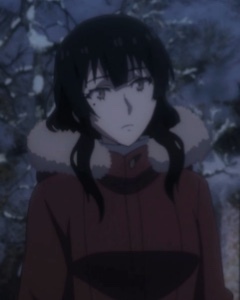 Quick Summary: Sakurako Kujō is a brilliant osteologist who uses that knowledge to solve crimes. She forms a tentative relationship with Shotarou Tatewaki, a high school student’s who’s taken with her. However, because of her past, Kujō can’t bring herself to open up to him. Together, they solve several cases, many of which revolve around a mysterious man who steals a particular bone from his victims. How’d It Do? While the beginning episodes held my interest, I felt that interest waning in the middle episodes. The good news is that I found the last third of the series very enjoyable. Beautiful Bones: Sakurako’s Investigation relied on some gimmicky animation when Kujō got serious about a clue, but otherwise, I thought the individual cases were thought-provoking. I particularly enjoyed the relationship that grew between Kujō and Tatewaki. The last episode in particular did a fine job of show-casing their growing affection and respect. I think I liked The Asterisk War better, but I’d still recommend this. Quick Summary: Yōtarō Hanabusa is one of the last surviving Knights of the World. He travels the world with his horse, Shirohime, who can transform into a human shape when needed. He has a compulsion to help ladies in distress, and he can’t help but kiss the back of their hands after he helps them. Understandably, many frown on his affectation. However, he saves one young lady, Makio Kidoin, who becomes infatuated with him. How’d It Do? I was afraid of this: I was so far out of this show’s target audience that I couldn’t make it past four episodes. Please understand: I don’t think it’s a bad anime, and I don’t fault it for being what it is. It’s just that someone with my tastes in anime didn’t find this appealing. I suspect (though I don’t know for sure) that a younger audience might enjoy this quite a bit. 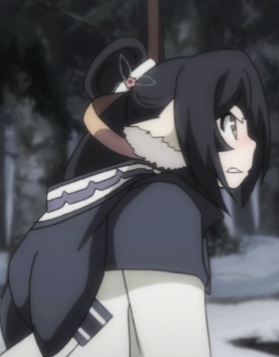 Kuon teaches Haku that tails are, in fact, real. Capture from the Crunchyroll stream. Quick Summary: Dressed in a modern hospital gown, Haku wakes in a cold cave. Within minutes, he’s trapped by a vicious insect several times his size. If it weren’t for Kuon’s quick thinking, he would have been killed. He’s surprised to find that she has a tail and canine ears, and he’s also surprised to find that he remembers nothing of his past. Kuon helps him integrate into society. Together, they meet new friends, solve problems, and come to the attention of the Emperor and the future Empress. The show is only half done this season; it looks like it’ll have 12 or 13 more episodes. How’d It Do? Funimation streamed the original series called Utawarerumono some years ago. A few of the characters from that series appear in this one. The False Faces on Crunchyroll, at least so far, focuses more on humor and light-hearted stories than did the original. There’s also a heavier emphasis on female characters like the princess Rurutie, Oshutoru’s little sister Nekone, and the quasi-outlaw Nosuri. This isn’t a bad thing by any stretch; it’s just a difference from the original. The show emphasizes the relationships between the female characters as well as Haku’s lackadaisical attempts to find employment and fit in. It’ll be interesting to see if he ever remembers his past. I’m especially curious about the hospital gown. I recommend this show because it appeals to the part of me that likes extensive character interaction without an undue emphasis on violence as a means for dramatic progress. Lapis Lazuli enjoys maintaining a human form — no one knows why. Capture from the Crunchyroll stream. Quick Summary: Takeru Kusanagi commands a platoon of misfits called the 35th Test Platoon. 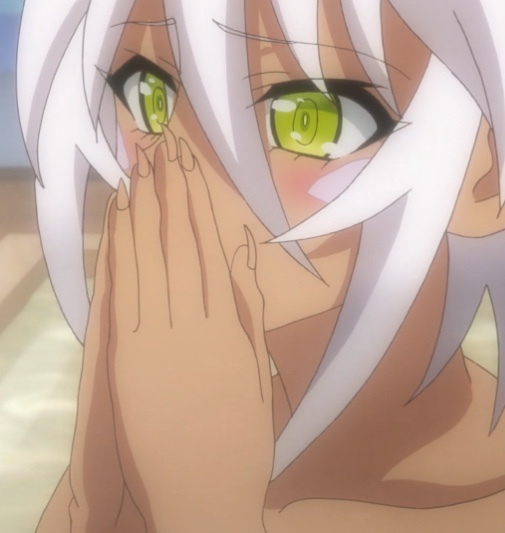 He’s been unable to make the team of Usagi Saionji (his sniper) or Ikaruga Suginami gel. That’s why he was exasperated to find that the principle, Sougetsu Ootori, assigned a highly skilled but demoted Inquisitor, Ouka Ootori to his team. She was strong willed and unwilling to listen to the leader of such a low-power platoon. On top of that, the principle assigned an amnesiac witch named Mari Nikaido to the 35th. Never mind that witches were their mortal enemy: Ootori absolutely hated Nikaido if for no other reason than she was a witch. On top of that, Kusanagi contracts with a Relic Eater named Lapis Lazuli. She’s powerful but has her own quirks. How’d It Do? The first 90% of this series exceeded my expectations. I liked how Kusanagi built a respectful relationship with the women on his platoon. By “respectful”, I mean he didn’t try to take advantage of his position to extract “favors.” Instead, he honestly tried to help them deal with the issues they faced. In return, they began to coalesce as a team. This was especially true as they all tried to help Suginami deal with her sister and her ties to one of their enemies. However, I have to confess the last episode disappointed me. Kusanagi wanted to save his sister, and the only way to do that was to make an irrevocable contract with Lazuli. However, by the end of the episode, the “irrevocable” aspect seemed to be forgotten. That kind of thing really bothers me. Other than that, I admit I enjoyed watching this series. Zest gets major points for not wanted to be just protected, but to also protect. Consent’s a major plus, too. Capture from the Crunchyroll stream. Quick Summary: The second season picks up where the first season left off. Basara Toujoi, the only male in his household, struggles to protect the heir to the demon throne, Mio Naruse. Naruse’ “sister,” Maria Naruse, is a succubus whose nature informs all of her decisions. She is, however, completely dedicated to both Toujoi and Mio; it’s just her view of the world is decidedly sexual. In this season, they descend to hell and become embroiled in its politics. Joining them are Yuki Nonaka and her sister Kurumi Nonaka. To ensure their loyalty and strengthen the team, Marie “helps” by subjecting the Nonaka sisters to the same curse that she laid on Mio. This curse means that if they have any thoughts that could be construed as disloyal to Toujoi, they will writhe in sexual pain until he releases them. The demon Zest was introduced at the end of the last season, and she joins the team as well. How’d It Do? Okay. We’re all adults here, right? Otherwise, I’m going to be pretty embarrassed to admit I enjoyed this series. Was there anything particularly redeeming? I’d say yes: despite their flaws and potential conflicts of loyalty, Toujoi remained loyal to his family (okay; his harem) and fought hard to protect Mio. So did everyone else, from the Nonaka sisters to Zest to Marie and even Marie’s mother. 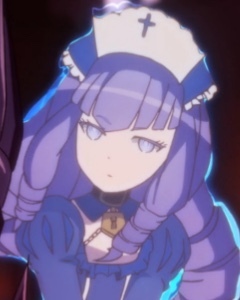 I enjoyed hell’s politics, too, because there was a clear distinction between the followers of Mio’s line and those who simply wanted power for themselves. I have to wonder if it’s realistic for characters like Toujoi and Mio to really exist, given what real politics look like (even as portrayed by Concrete Revolutio). In the final analysis, all sexiness and wish fulfillment aside, I think that’s why I liked this show. Its characters were able to defeat a politically astute foe and restore some form of peace and prosperity to their realm. I’d like to think that something like that was possible in the real world!